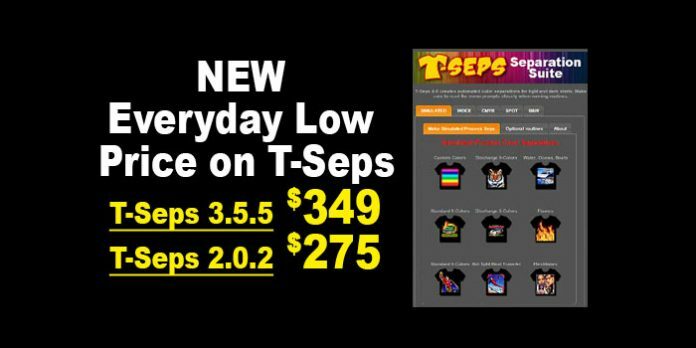 Home Featured Home New Low Everyday Price on T-Seps! In order to help everyone be able to do high-end color separations we have now established a new “everyday low price” of $349 for T-Seps 3.5.5. (Photoshop CC versions) and $275 for T-Seps 2.0 (Photoshop CS6 and older)! This is a one-time fee and not a yearly subscription. And, you can put T-Seps on TWO computers. You get simply the best automated color separation software on the market with direct phone and remote support. Six color seps for smaller shops. CMYK seps including CMYK on black shirts. Old Photo and Black and White seps. Exact monitor display of final print for proofing. Job Proof for shop and customer. Special Effects, Distressed and more. Halftoned files. No RIP needed. Works great with files from Illustrator and Corel. One license allows for two computers. Free support and advice directly with Scott Fresener. PLUS… We now include our Online Master Class on Photoshop with every Full Version of T-Seps. 27 videos! Learn Photoshop and be a T-Seps master. Download a FREE TRIAL of T-Seps and T-RIP HERE. If you haven’t done much high-end printing then let us prove that you can do it – even with a six color manual press. Download on of our test files, burn screens, make a print and get convinced that it is not too hard – with great separations! Previous articleSIZZLING SUMMER SALE. Extended to September 30. Next articleEvents Calendar Updated Through 2019!